Jay Polakiewicz, Liam Davis, Marco Caserta, and Jake Moorman approach the finish line for undefeated Masconomet. 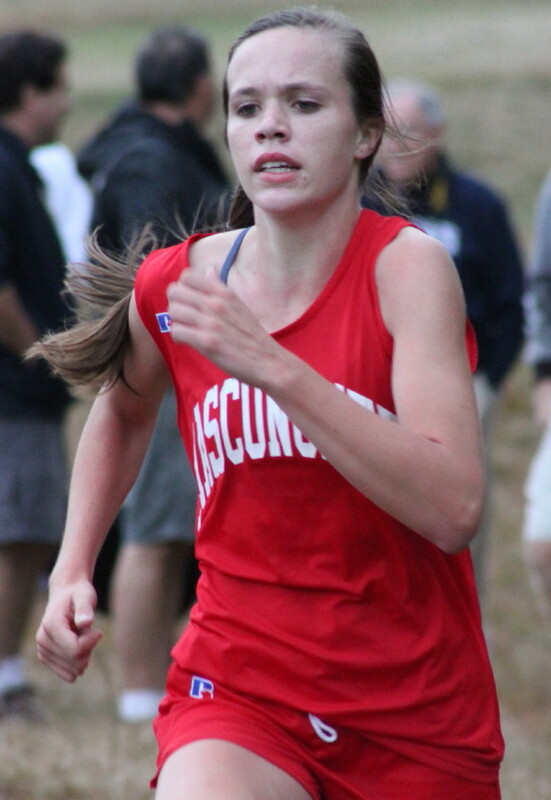 (Topsfield) No question that Hamilton-Wenham has the best girls cross country team in the Cape Ann League and probably in the state. 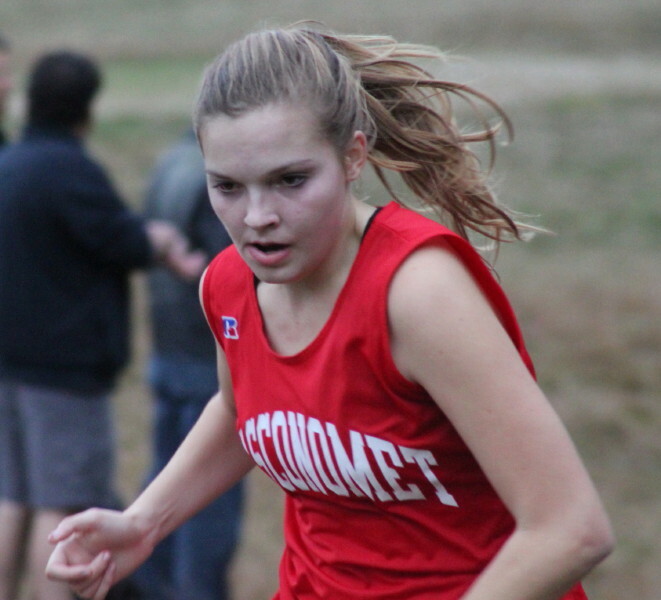 The question of which girls team was second best was decided yesterday afternoon at Bradley Palmer State Park as Masconomet (8-1) edged Pentucket (7-2), 27-28. 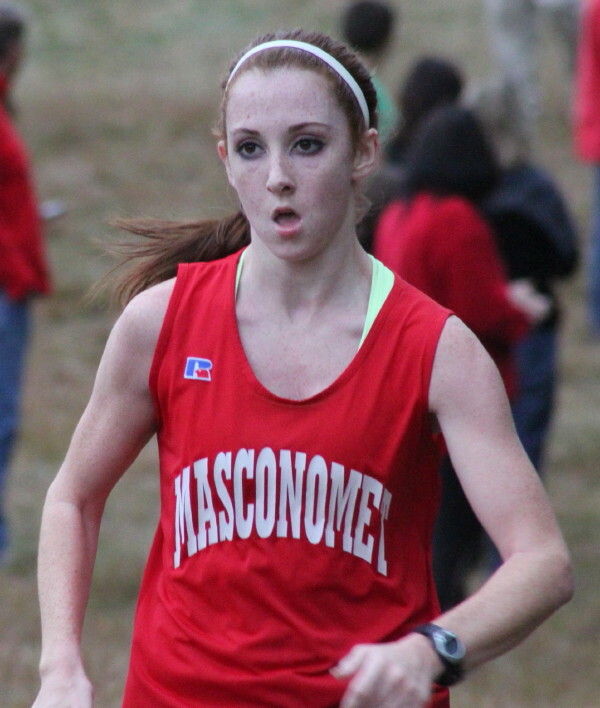 Fiona Davis of Manchester-Essex finished 5th overall but her placement is not included in the scoring between Masco and Pentucket. Fiona fooled me because she was wearing a green shirt and I thought she was with Pentucket and was part of a 26-30 Sachem win. 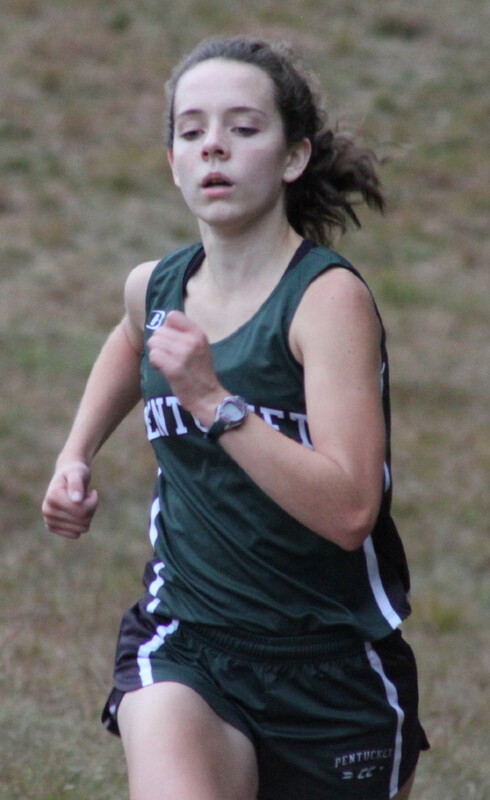 As I saw it, the race within the race was over positions 5-8 between Masco and Pentucket and that was where the Chieftains Mila Zernich and Lily D’Agostino held off Sachems Brianna Repke and Emma Marchant. 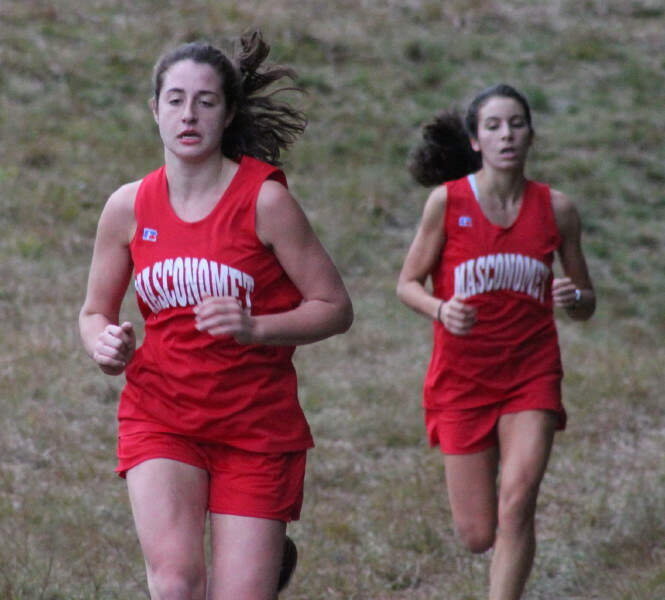 When the four runners went past the starting line partway through the race, they were close but by the end of the race there were sizable gaps and Masco had the key 5th and 6th spots. 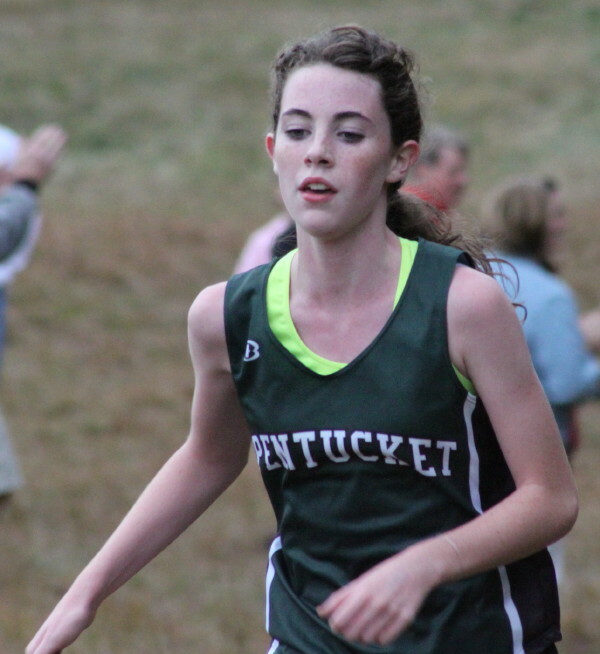 Senior Rebecca Morse cruised to victory for Pentucket and has to be the favorite to win the Cape Ann League Open on October 29th back at Bradley Palmer. 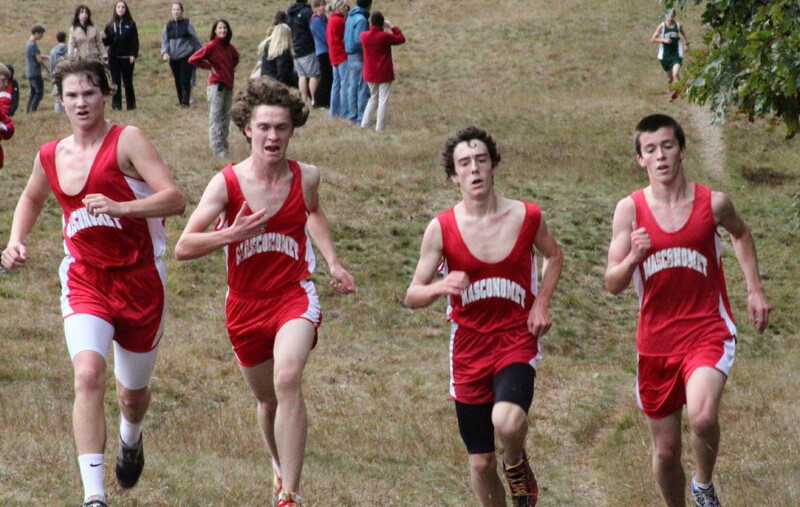 The Masconomet (9-0) boys team remains undefeated with a convincing, 16-45, win. 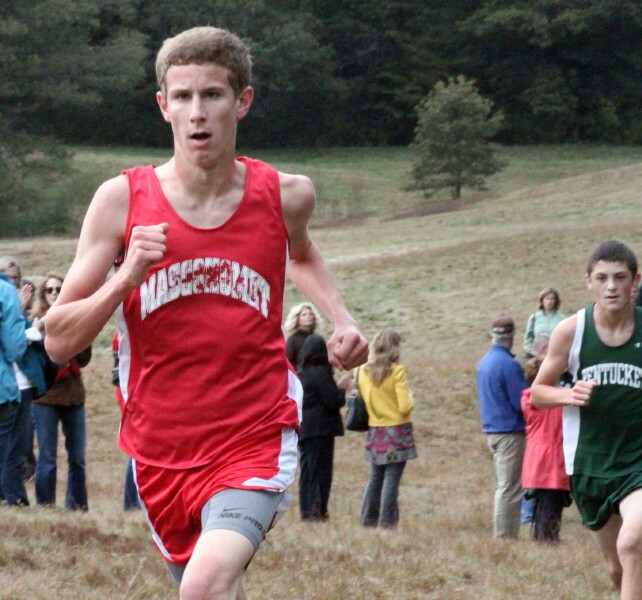 The top four runners finished together for Masco and Scott Gilfeather crossed 6th for the Chieftains to complete their scoring. 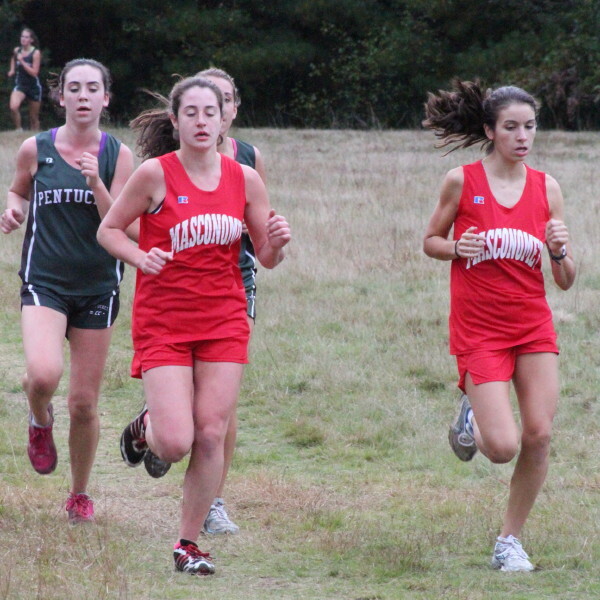 Four girls battle for 5th and 6th partway through the race. Next week (October 19th) the Chieftains return to Bradley Palmer for a showdown with equally undefeated Newburyport. It will be nice to see how individual runners can do. I doubt that we’ll see runners from either squad slowing up so that they can finish side by side with teammates as both teams have done repeatedly this season. This was my first look at the Sachems identical twins, Tom and Joe Labrecque. The only hope of telling them apart is that they wear different colored running shoes. 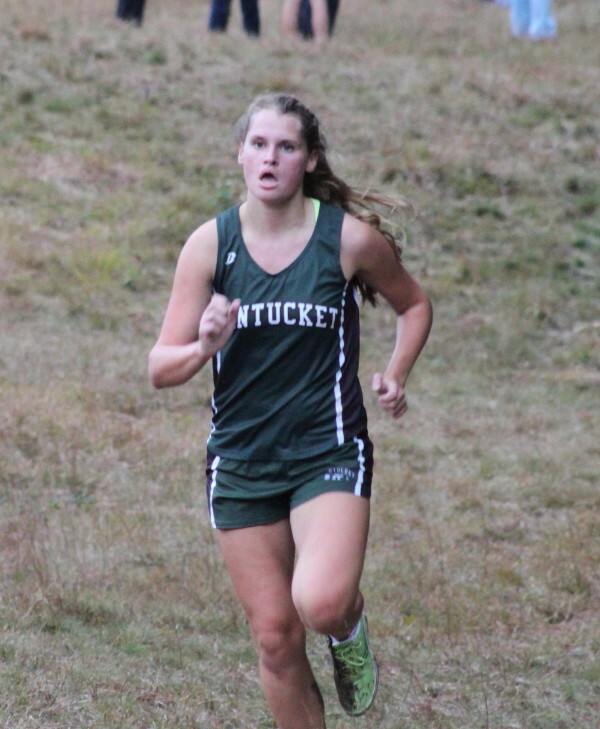 I chose this meet because after checking records I assumed that the Masco/Pentucket girls race would be a close one with something (2nd place in CAL) at stake. 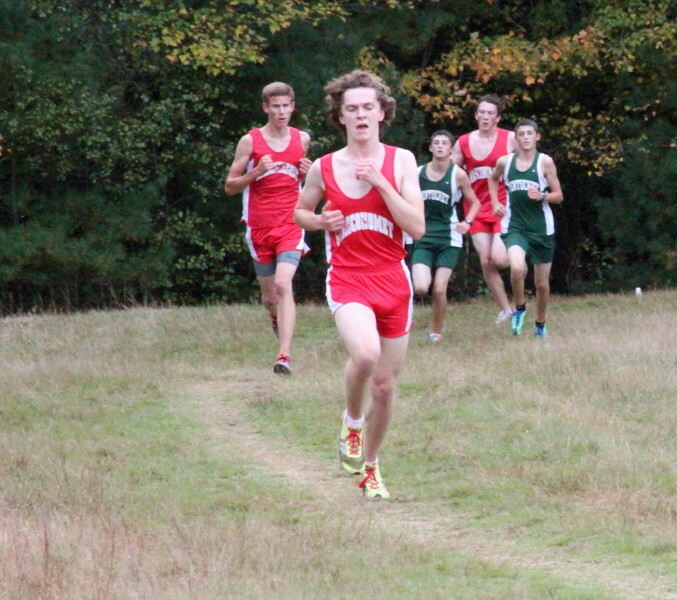 I also assumed that the boys race would be a mismatch, based on the records, but I would get a look at the undefeated Masco boys. 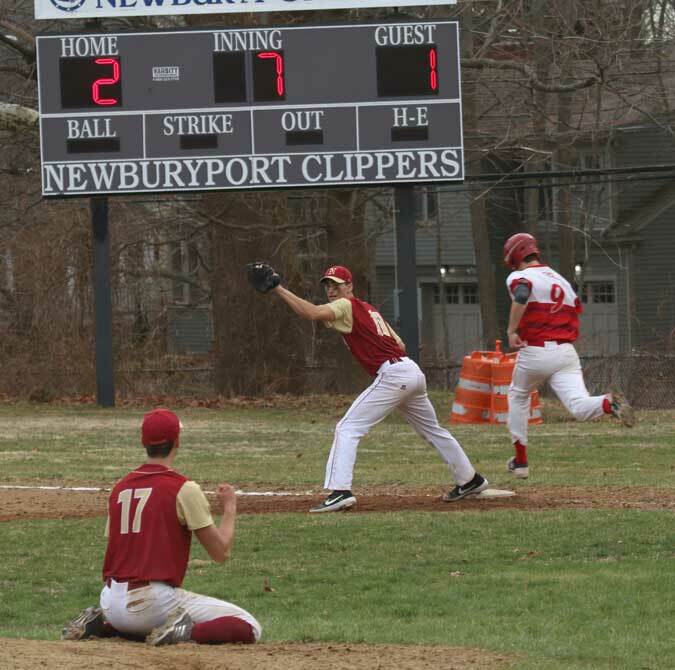 I have seen the Newburyport boys win easily twice (North Andover & Hamilton-Wenham). Next Wednesday’s meet between Masco/Newburyport should be an excellent take. 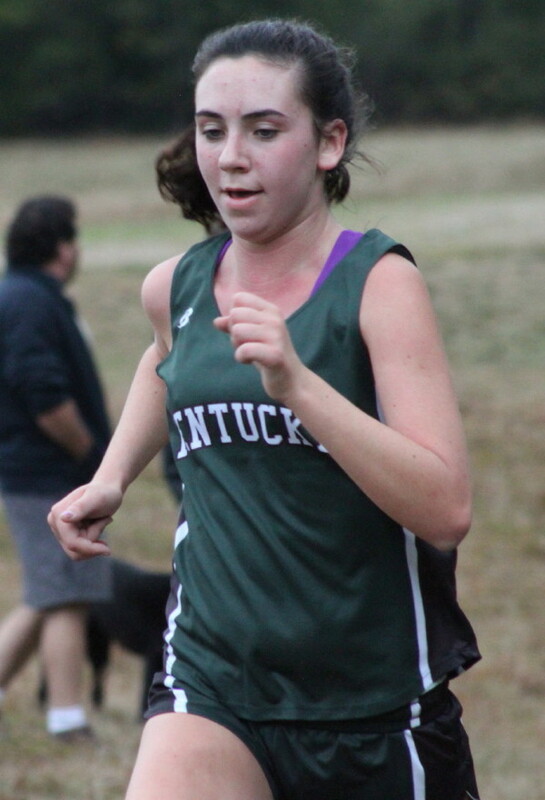 I will admit that trying to cover yesterday’s cross country meet has been an adventure that only a retiree with time to spare could pursue to the end. 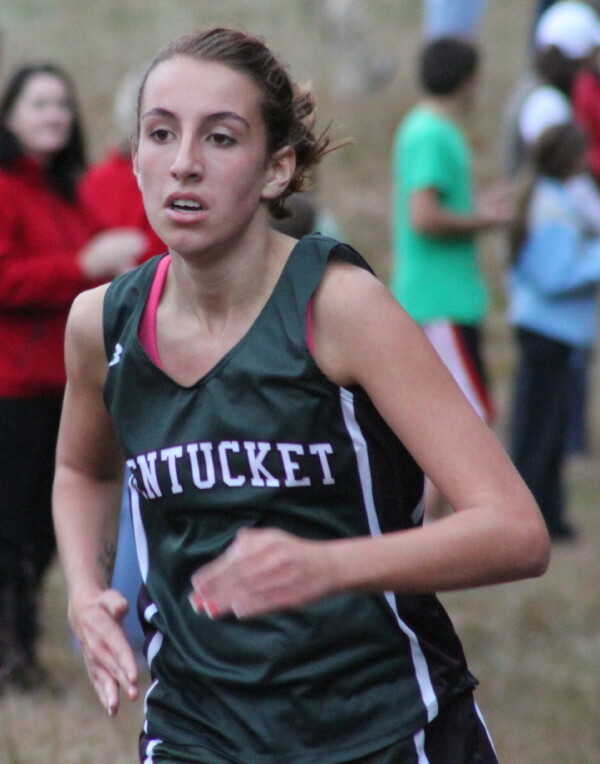 The Newburyport News had the meet at Pentucket. 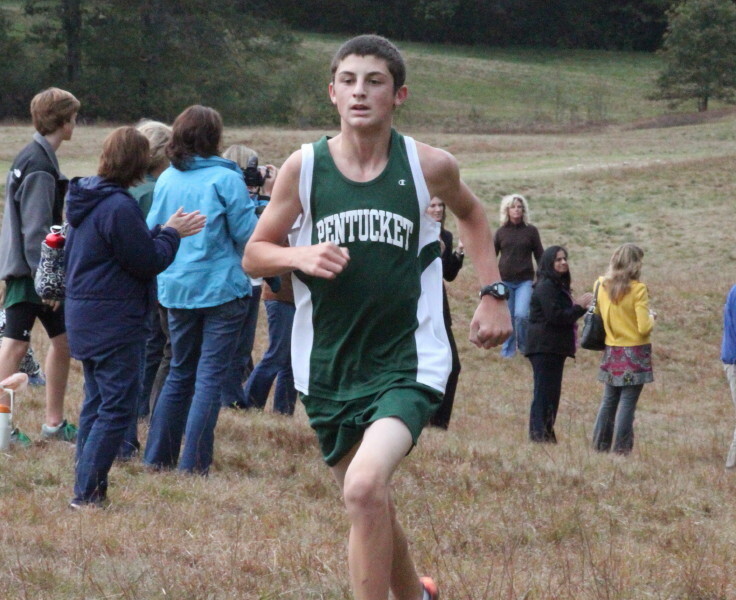 I called Pentucket and they said the meet was at Bradley Palmer. I called Masconomet and was assured that the meet would be held at Bradley Palmer which was where Masco’s meets were held. 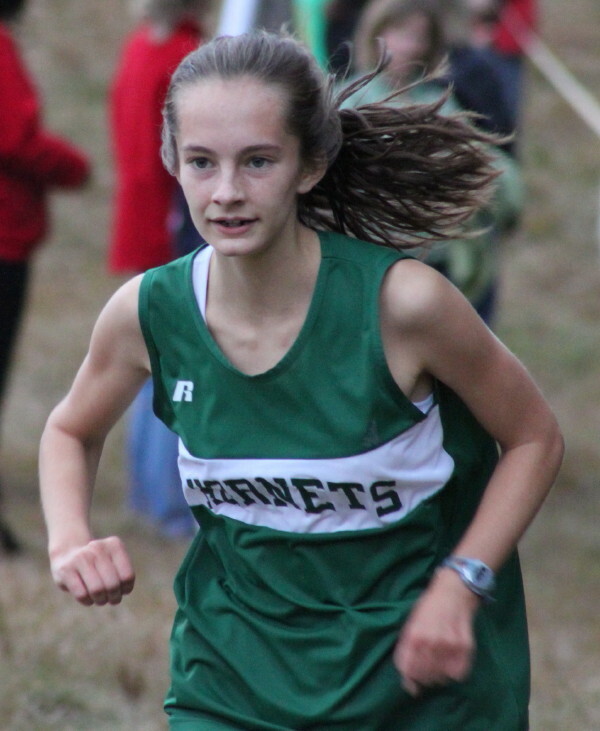 I took pictures at the meet and assumed that the next day the Lawrence Eagle Tribune or the Newburyport Daily News would post the complete results which I could match with my pictures. Wrong again. That left me needing help to identify pictures and that’s where Patrick Mahoney (Masco boys) and Todd Ruland (Pentucket girls) came to my rescue. Thanks, gentlemen. The pictures in this entry assume normal size if you click on them. Enjoy. Labrecque twins running side by side (in green) – note the shoes.